You may easily customize the search refining filters and display columns in each of the document queues. Simply select your desired filter settings and check/uncheck the Column name checkboxes and Save Filters . The customization(s) you choose will be applied to all Document queues. In the KB Admin Tools, navigate to the Documents tab. On the left hand navigation bar, you will see five queues: Active, In Review, In Progress, Inactive and Trash. In each queue, you will find filters with which you may refine your document search. A table with many columns will appear displaying the results of the search based on the filter settings. You may save the filters and hide/show the columns of your choice. The end result will be a table of documents refined by your filter selections and further refined by displaying the data in the columns of your choice. Your document search filter selections refine your document search. The image below shows the filters available circled in red. Each filter in the image below is in their defaulted selection. You may customize the defaulted filter results by setting each filter to your desired setting. To search for documents in KB Admin Tools, click the Documents tab. By default all documents at In Review status are displayed. The following links in the left side navigation menu act as short cuts to lists of documents by status. Click on any of these links to see a list of your KB group's documents of that status. For example, to see all documents with the status of "In Progress", click the In Progress link. In addition to the left side navigation links, document searches can be further refined by using the filter fields across the top of the screen. A document ID number or query string may be entered here. If a document ID is entered all other filters are ignored and that document is opened for review. If a query string is entered results from a keyword search will be returned for all documents whose title or keywords contain the query string entered. Case is ignored. All other filters will be used in a query string search. Click the Go button on the far right hand side to execute the search. Enter keywords here. Results from a keyword search will be returned for all documents whose title or keywords contain the query string entered. Case is ignored. By default, Keyword searches are run. In this dropdown, you can choose from searches; Keyword and Full Text Search (FTS) with the query string and other filters. By default, Keyword searches are run. In this dropdown, you can choose from searches; Keyword and Full Text Search (FTS) with the query string and other filters. You may also select a Priority for your documents; Top (document title preceded by 4 asterisks), High (document title preceded by 4 asterisks), Normal (no asterisks preceding document title), Low (is given the least priority and appears closer to the bottom of your search list) or Exclude (document can be set to active and will not be found in the live site using a keyword search. The only way to view a document excluded from search on the live site is to enter the exact document ID number. Lists documents in the specified topic. Options to select All topics or No topics assignment are available in the drop down in addition to all topics set up in that KB group (must have drop down check box selected in Topics tab). The example below shows the topics in the KB User's Guide KB. The All topics selection is defaulted at the top of the list and the No topic assignment selection is defaulted at the bottom of the list. Lists documents delineated by a specific Audience. Defaults to "all Audiences". Please see KB User's Guide - Documents Tab - Audiences for details. Use this drop down to limit results to documents of a specific Status. Choices are: Active, In Review, In Progress, Active/in Review, Active/In Progress, Inactive, Trash and All status. 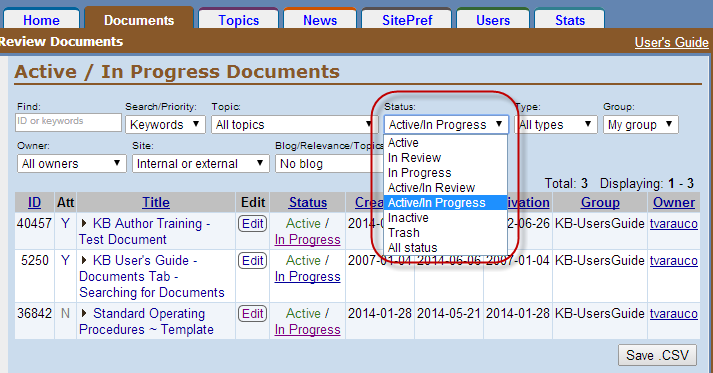 Below is an example of choosing documents that are in the status of Active/In Progress. Use this drop down to limit results to documents of a specific Type. Choices are: All types, Document, Glossary, Template. Use this drop down to limit results to documents of a specific Group. Choices are: My group, Other groups, All groups. Select Other groups so see all documents being shared in to your group. Use this drop down to limit results to documents of a specific KB author or author/admin. Names are listed last name/ first name. By default All owners will be selected. Use this drop down to limit results to documents by internal and/or external site. By default, Internal or external will be selected. Choices are Internal or external, Internal and external, Internal only, External only, Internal all, External all. Use this drop down to limit results to documents that have or do not have a blog. By default, No blog will be selected. View documents by relevance such as My/sharing groups, My Campus, My University System and Universal. Use this drop down filter to limit results to documents of specific a Site Access restriction(s) based on the presence/absence of a valid campus login. Choices are: Defer to SiteAccess, Ext/internal with campus login, Internal for all campus users. This setting defaults to All campus access options. By default results are displayed 25 documents on a page. Use this drop down to adjust the number of documents displayed on a page, which can go as high as 800. Click Go to execute the search. At the bottom of the page, a Save .CSV button on the right allows you to export the refined set of documents yielded by your search. Below that button, you will see pagination links. Finally, you will find comma delimited document ID number(s). This string of document ID numbers can be used to manage the documents in bulk, should you have the correct permissions. After you have made your filter selection(s), turn your attention to the Column Name Display Setting check boxes. The image below shows the Active Documents screen reached when you click on the Active link in the left navigation bar. Below the Document search filters, you will see a series of check boxes next to a their corresponding column name. The image below has a red circle around that series of Column Name Display check boxes. The following are the columns you may choose to display or hide by checking/ unchecking their checkbox. LastUpdater- Displays the netID plus domain name of the last person who updated this document. please see KB User's Guide - Documents Tab - LastUpdater filter for more information. Save Filters link- To save your filter selection as default, click on this link. This link will then say "Filters Saved" in green. Once you have selected the columns you wish to display, click on the Save filters link. If you hover over the Save filters link, the tag will indicate you are saving your selection as your default display. Your customizations will be applied to all Document queues. The Save Filters link will turn into a green link "Filters saved". The tag will say "Saved filters as default". You may change your customized filters and/or column settings quickly and easily. All you have to do is go to the Document queue of your choice and look for the Delete saved filters link. From here you may either select the filter and column settings of your choice. You will see the Delete saved filters link change back to the Save filters link. If you would like to return your filters and columns to the KB default. 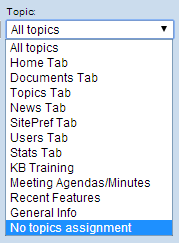 Click on the Delete saved filters link and refresh your browser while in the KB Admin Tools.